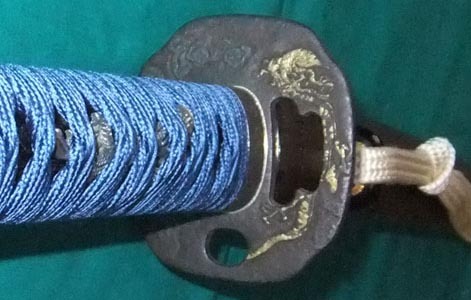 This is a cord that passes through the ring (Kurikata) on scabbard. This cord can fasten the sword with waist belt. The ring for this cord is made of metal or buffalo hone. We don't know the exact manner to take the cord onto waist belt. In peaceful days, it was taken like the pictures bellow. 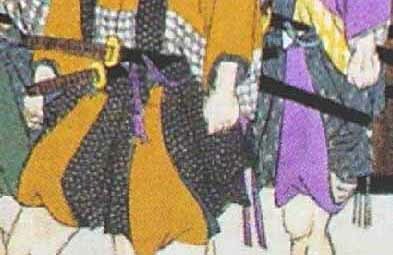 An easy walking samurai in 16th century: The cord of longer sword is hung at the reverse of scabbard. The shorter cord seems to put in the waist belt. 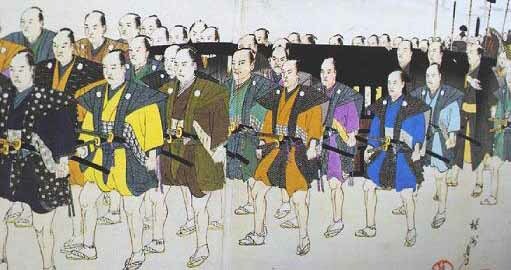 Formal parade of samurai in 19th century: The longer cord is hung behind the scabbard. The shorter cord is knotted at the end of it, and hung. In the battle field, soldiers should take the cords more tightly to hold the scabbard on their waist. In some fencing styles, the end of longer cord is turned again toward the front, and put into the waist belt. The hook is an equipment to catch waist belt. It settles the scabbard in waist belt, not to be drawn together with the blade. It may be useful for single hand drawing or rapid drawing. It is made of metal or buffalo hone. This equipment is common before 16th century. Later, it becomes to be omitted sometimes. Probably, it is a trouble for everyday putting on and off in peaceful days. Ring and hook on tanto mount: They are made of silver, and put on copper tube. The motif is bamboo and tiger. Sometimes, we found an unique hook that looks like a knob. Such a hook has less work to catch waist belt. 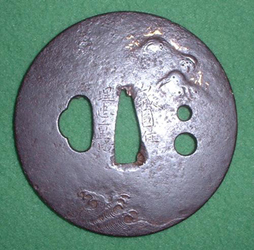 One of such hooks is Satsuma style. 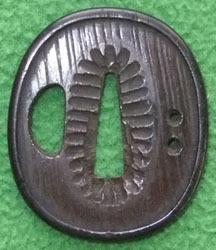 Sometimes we find a tsuba that has two small holes on it. That is not a design, but has an utility. The two small holes on this tsuba is originally drilled. The two small holes on this tsuba are not original, but done later. 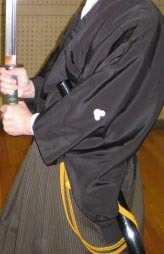 The two holes are used to fasten it to the ring (kurikata) on scabbard with string. Such system was taken by some swordsmen. Usually the string is paper wire or something easy to cut. Sometimes it is done for young boys to help blade slipping. The clan Satsuma is famous for that system. 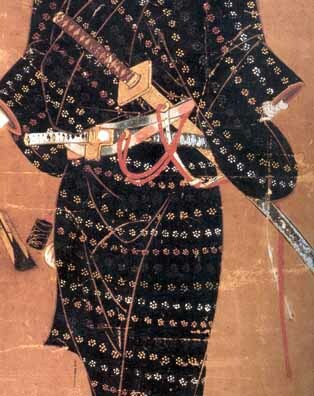 Satsuma is one of the most famous clan that had many brave soldiers. The swordsmanship there was very hard and powerful. All the samurais in the clan learned that from their childhood. Parents are afraid their boys, if they use sword against friends or normal citizens emotionally. Amateurs easily want to use their newly learned technique to others. Then, parents fasten the blade into the scabbard tightly with wire. Then, teach the boy, draw the sword together with the scabbard and attack breaking scabbard when you have to make justice. Therefore the Satsuma style mount has knob like hook that doesn't catch waist belt. Sometimes we find another type of holes on tsuba. That is one or two holes at the lower part of tsuba. It accords with the area at the back of blade. Usually the holes are bigger than that for string. The big hole at the lower part of this tusba is not only for a design to call the dragon from the reverse. This is a hole to fasten the wrist to tsuba using silk cord or leather cord. Such a system is taken in battle field not to slip down the sword.